Because we spend a considerable time at work, it is important to find out how to eat healthier while we work because healthy eating affect our job performance. When we eat well, we feel better, we are more energize, and we perform our job more efficiently. Over time, this can affect our success with future promotions. A 2005 study conducted by the International Labor Organization found that poor nutrition can negatively impacts the morale, safety and productivity of workers. 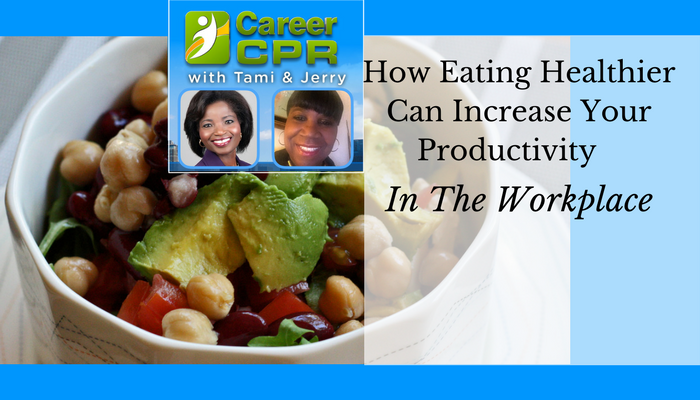 It was reported that poor diet on the job is reducing productivity in countries around the world by as much as 20%. This study highlights why working better and furthering your career goals are additional reasons to adopt a healthy lifestyle. A healthy diet will not only help us control our weight, but it can help us improve our concentration, alertness, problem-solving skills, and our job productivity. The link between proper nutrition, increased productivity, and your career is that When we don’t eat well, we don’t feel well, or function appropriately in the workplace. Remember the saying that “you are what you eat”, when you eat healthy you feel healthier. What you eat has a daily effect on your physical and mental health. Eating healthy improves many aspect of your life such as sleeping pattern, energy levels, your mood, and work performance. The foods we eat affect us more than we realize. Food has a direct impact on our cognitive performance, which is why a poor lunch choice can affect your entire afternoon. The foods we eat are converted by our body into glucose, which provides the energy that we need to stay alert and perform. If the food intake is decrease, one cannot focus or concentrate efficiently. Nutritious foods helps maintain a stable blood glucose level and minimize craving. So it is important to know nutritious foods. When we are tire, we tend to reach for processed foods that consist of empty calories. Foods such as pasta, bread, cereal and soda, release their glucose quickly, leading to a burst of energy followed by decrease in energy. The other food, like high fat meals like cheeseburgers or chicken nuggets provide more sustained energy, but require our digestive system to work harder, and this make us have less energy. We all know that eating healthy is good for our body, mind, and performance. But it is not that easy. So, how do we do it? We can start by Making our food choices before we get hungry.It is best to plan ahead when going out to lunch or ordering in because you make a better decision about resisting unhealthy foods. Don’t wait until you get hungry to eat. Eat small frequent snacks before lunch or dinner, this will keep your blood sugar steady throughout the day, keeps you alert, and increase your performance. Plan to bring healthy snack such as fruits, vegetables, nuts, ect to snack on at work. Research indicates that eating fruits and vegetables throughout the day is good for the body and mind. People who consume more fruits and vegetables tend to be happier, more engaged, and more creative. Choosing a banana over a bag of chips will make a greater impact on your energy level. Good eating habits improves physical activity in the workplace, it also enhances motivation. Eating healthy improves your life style at home as well as at work. You should focus on healthy food choices. It is best to bring lunch from home. Develop healthy meal strategies by reading labels and pamphlets. If possible, prepare the foods that you plan to take to work during the week on the weekends. When we start eating healthy at work, eventually we start eating healthy at home as well. When making healthy choices, it helps create and maintain healthy body and mind. However these choices takes time and motivation. Especially if they rely on the organization’s food supply from the cafeteria, vending machines or the nearby restaurants. Employers can help improve healthy eating behavior by developing educational programs, literature and promoting healthy lifestyle, focusing on disease prevention. Eating healthy is not learning to resist the temptation, if you are serious about achieving desire workplace performance, making smart decisions about your food choices are critical. In general, people who maintain healthy food habits significantly reduces their stress level, have more energy, are physically fit, and they are in better health. And people who are in better health are able to work longer and have higher quality of life. We hope we have share with you why and how to eat healthy and improve your job performance.